Sporty. Precise. Sophisticated. These are just some of the long list of adjectives that come to the minds of both casual and dedicated watchers of the timepieces when it comes to chronographs. There is just something about the typical chronograph’s design that places many different time-measuring units side by side in one package. Of course, just like with a novel or short story or movie, there is a wide range of quality possible within the chronograph format. Some chronograph models are so obviously hastily put together that they have the same quality as a hastily-put-together novel or short story-shallow, superficial, and, ultimately, weak. If you are in the market for a chronograph worth its salt, you need to go beyond formula. You need to pay attention to the manufacturer’s attention to detail and watch’s level of craftsmanship. These are the elements that separate chronographs that are merely going through the motions to fill out a brand’s model year catalog and a genuine specimen of watchmaking manufacturing excellence. You owe it to yourself to only buy the latter type of chronograph. Thankfully, one of the oldest names in precision timepieces, Bulova, can definitely steer you straight when it comes to chronographs. Make no mistake about it, the Bulova Men’s 96B175 Precisionist Chronograph Watch offers a beefy heaping serving of all the things that make the chronograph watch interesting: Precision timing? Check. Minutes unit? Check. Hours unit? Check. Centralized design with tachometer bezel? Check and Check. Still, you know the Precisionist is a Bulova watch because it is not content to be comfortable with the Chronograph formula. It dares to go beyond. The Precisionist features that distinctive Bulova touch-the sweeping second hand. This unit also adds a clean, sleek, and precise look to the multiple unit chronograph design. This should not be a surprise. After all, Bulova’s been around since 1875 and is famous the world over for its accuracy. 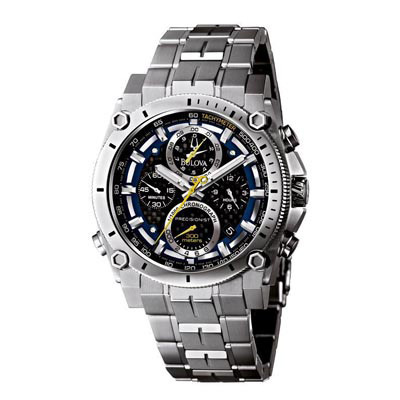 Overall, the Bulova Men’s 96B175 Precisionist Chronograph is a great example of Bulova attention to detail, compelling design, and precision manufacturing. Given its high level of quality, this timepiece is actually a great deal at the price range it is in. The Precisionist’s design delivers on the chronograph formula in a distinctly Bulova way. Not only do you get the features of a classic chronograph laid out elegantly, but the stainless steel casing and bezel design conveys the look of the type of watch an active man would want. Whether you’re scaling mountains on a climbing trip or scaling the corporate ladder, this watch not only makes you look good but is also sure to deliver the right time. Considering the look, the style, the attitude, and the pedigree of this watch, many people would be amazed at how affordable it is. Well, if you’re curious the answer is quite simple: Japanese quartz movement. You can count on the price of even the most luxurious watches to drop quite a bit once you swap out manual or automatic movement with quartz movement. This is not to say that the Precisionist is in any way inferior or less desirable. Not by a long shot. This timepiece might be a quartz-powered watch but it uses Japanese quartz technology. Japanese quartz packs a small price footprint but is backed up by high precision Japanese manufacturing technology. If you find yourself out on the road jogging or hiking up a trail when the sun sets, this timepiece has you covered with its luminous display. There are chronographs and there are chronographs. The great thing about the Bulova Men’s 96B175 Precisionist is that you get all the tight design elements of a proper chronograph mixed with the mission-critical accuracy of Bulova in a nice sporty package. Coming in at a very accessible price, this timepiece makes for a great all-around luxury active watch choice.